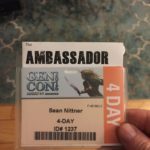 Yay for the wonderful Games on Demand community at Gen Con. Because of all these awesome peeps, I got a chance to playtest Big Bad World. What is Big Bad World you ask? 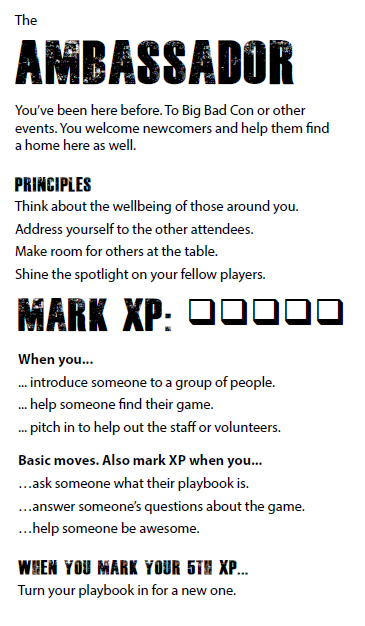 In the middle of that once of us said “When you introduce someone new to a group, Mark XP” and then our minds exploded! 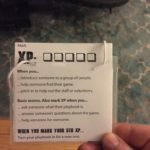 What if we could gamify social interactions? Reward positive behavior, and better yet give people an alibi for positive behavior? 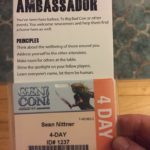 C’mon, I’m a social guy, but there are plenty of times I’ve been at a con and seen someone I recognize but was too shy to introduce myself. Heck, this year even I saw Eloy Lasanta three times before I finally got up the nerve to break into his crowd of people and say hi. And he’s a contributor to Baba Yaga’s gift box! 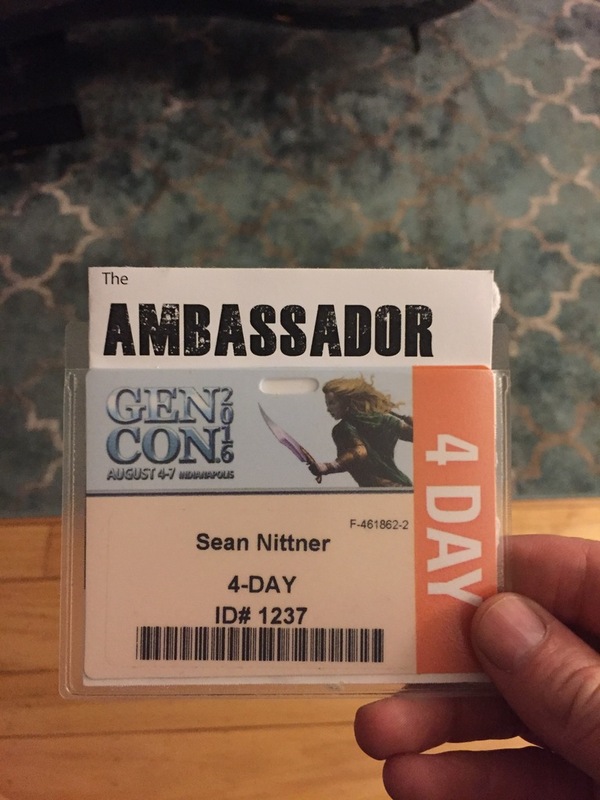 I printed a few of these up, and thanks to Kristin Firth for going out and helping me find a FedEx Office that sold badge holders (I had forgotten that Gen Con just uses lanyards) we were able to playtest it at the con. My star players (Kristin Frith, Andy Munich, and Jenn Martin) all returned multiple completed playbooks back to me with suggestions for how to improve them. Thanks alpha playtesters! 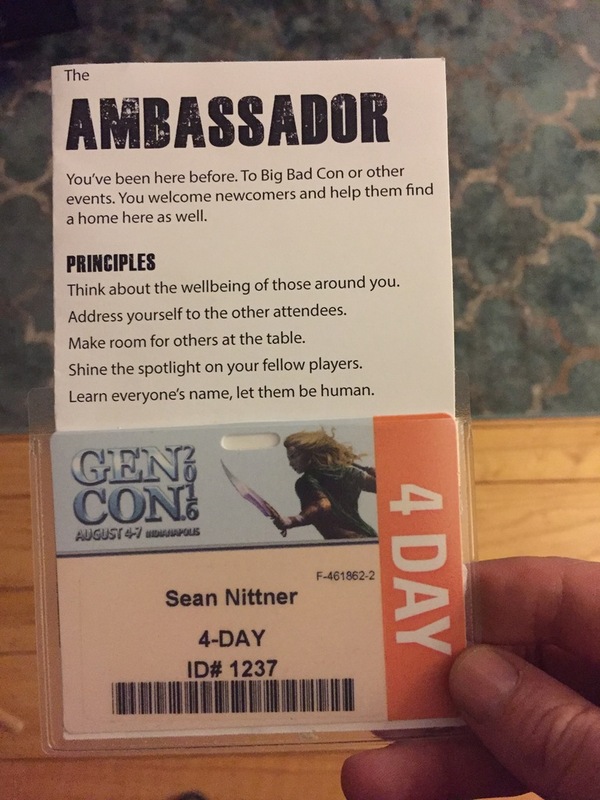 In addition we had at least 20 more people who tried it out, and as I walked around Games on Demand, I frequently saw people with playbooks behind their badges. Peeps were so great. I just love how eager folks were to try something new and how quickly everyone who played just “got it”. 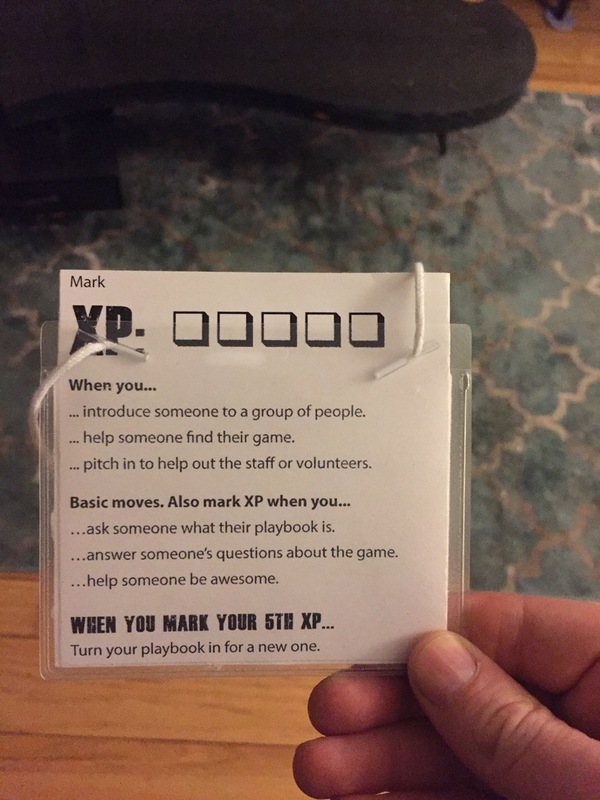 My reward for completing a playbook was…getting another playbook but the intent is to make the reward a pin or a ribbon. I like both options and will have to weigh them against each other. The ribbons are cool, but since there are four playbooks, getting four ribbons could add up. Pins are also cool (I love me some pins!) but I worry about them getting lost in the sea of pins we already give out. Must ponder more. I wish I had been more organized about soliciting feedback. 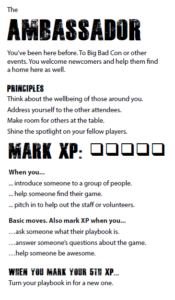 What I received was mostly about clarity and making sure the moves were approachable/doable, which was great, but I wish I had a better method to solicit all the feedback out there (Note: if you’re reading this and you played, please let me know what you thought of it!). Can I borrow these for my local con? Hi Paul, sure thing. We’re working on cleaning them up now and will distribute for others to use (and modify) as needed.